Montrose ended Annan’s fine run of nine games unbeaten but it took a superlative strike by Lewis Milne, Montrose’s recent signing from Forfar Athletic in the 40th minute to secure the points for the Angus outfit who still sit proudly at the top of the league. It was a superbly well taken goal one of the best seen at Galabank this season, it was just a pity that the Galabank Camera Man was absent to miss the strike which would probably have been in the running for goal of the month. It was a polished performance from the visitors who deserved to lift the points from Annan for the second time this season. Annan will probably concede that they under produced in a match that presented them with an opportunity to close the gap with the league leaders but at the end of the day Montrose displayed enough to suggest that they will contest the title and the play off positions to the end of the season. Annan boss Peter Murphy was forced to change his line up following the draw with the mid week encounter at Clyde with Brandon Luke the on loan striker from Dunfermline being introduced to the starting line up in place of the suspended Jack Brannon who was sent off during the Clyde match. 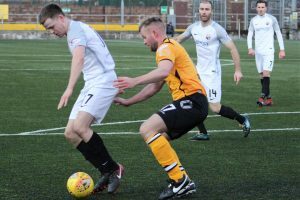 It was however a depleted Annan squad which took the field with injuries to Ryan Sinnamon and Scott Roberts and with Manager Peter Murphy suffering the flue bug it left Annan very much depleted. Montrose were more or less at full strength including Lewis Milne their most recent signing from Forfar Athletic and Michael Bolochowecky who was recalled from his loan spell from East Stirlingshire. Annan started the match promisingly when Rabin Omar’s excellent strike flashed past the upright, It was a narrow escape for visitors who were soon to respond by exerting a period of concerted pressure on the Annan goal and in the 12th minute Annan were fortunate when Paul Watsons effort crashed off the cross bar. It was a let off for Annan who had started slowly. Annan were finding it difficult to put their match together against the well organised Montrose team who looked comfortable, Templeman came close with a header from Milne’s cross in the 20th minute. Scoring opportunities were few and far between but in the 35th minute Gary Fraser latched on to a Templeman free kick and somehow from 8 yards the Montrose striker blasted the ball over the bar. Annan were then dealt a blow when Owen Moxon had to leave the field with what looked like a nasty injury to his ankle with assistant Manager Kevin Rutkiewicz taking up his place in the centre of midfield. Annan’s scoring opportunities were scarce but in the 39th minute there was a promising move down the left when Brandon Luke unlocked the Montrose defence to release Aidan Smith in on goal but the Annan striker failed to hit the target and the opportunity was lost. Minutes later Montrose went ahead with Milne’s stunning 25 yard strike which flew into the top corner of the net leaving keeper Alex Mitchell routed to the spot as the ball swerved past the Annan keeper. It was a stunning strike and one fit to win any football match. Annan almost responded minutes later through a penetrating Dan Orsi run down the right flank when the winger weaved his way into a promising position only to be dispossessed with Henderson and Smith having taken up positions in front of the Montrose goal. After a disjointed first half Annan stated the second half with more purpose and early efforts from Dan Orsi and Aidan Smith going narrowly past the post. Smith then had a promising opportunity but the striker showed no composure and the opportunity was lost. Montrose for the first time in the game were being forced to defend. Rabin Omar was next to try his luck with Fleming pulling off a fairly routine save from the shot. Montrose appeared to be thrown by the manner in which Annan had lined up in the second half and Montrose made a 60th minute substitution pulling off Webster and introducing Callaghan which appeared to give the visitors more shape to their team. Chris Templeman tested Alex Mitchell with the Annan keeper pulling off a fine save to deny the striker. Annan introduced Robbie Hogg in the 70th minute for his first team debut in place of Brandon Luke. Goal scoring Opportunities were few and far between with neither team being able to make a break through. Annan Athletic – Alex Mitchell, Scott Hooper, James Creaney, Owen Moxon ( Kevin Rutkiewicz 32 min), Peter Watson, Steven Swinglehurst, Dan Orsi, Rabin Omar, Aidan Smith, Blair Henderson, Brandon Luke (Robbie Hogg 73 min). Subs not used Ally Ferguson (GK), Ayrton Sonkar, Shaun Bell. Montrose : Alan Fleming, Graham Webster ( Liam Callaghan 63 min), Andrew Steeves, Matty Allan, Sean Dillon, Michael Bolocheweckyj, Lewis Milne, Paul Watson (Terry Masson 82 min), Gary Fraser (Craig Johnston 79 min), Chris Templeton, Jamie Redman . Substitutes not used Danny Cavanagh, Ross Campbell, Connor McLaren, Jordan Miller GK. Referee – Steven Reid. ​Assistants – Paul Reid and Colin Drummond. It was a day when Peterhead made their intent to win the title clear after an emphatic 4-1 victory over Stenhousemuir. Stirling Albion stopped their recent slump after they defeated Berwick Rangers 2-0 at Forthbank. Elgin City got back to winning ways with a home victory over Clyde who are still looking for their first victory under new manager Danny Lennon. Edinburgh City lifted the points in the basement battle recording a 2-0 victory away at Cowdenbeath a result which leaves the Fifers in a perilous position. Annans next match is away to Berwick Rangers next Saturday.